Cats in Halloween costumes are adorable. From lobster outfits to a scuba cat that’s ready to go diving for its own fish, we can’t get enough of these adorable outfits. Many of these cat costumes can be put together on your own — while others are available for purchase online. Even if you’re not a cat fan, it’s hard to deny that the Panda cat hasn’t won over your heart or that the Yoda outfit is anything short of amazing. From vampire cats and sea creatures to fairytale reenactments and superhero costumes, we can’t decide which Halloween outfits we love the most. One of the most popular types of cat Halloween costumes involves turning your adorable feline friends into a different kind of animal. Farm animals are especially popular because who doesn’t want to turn their furry little friend into a little piggy, lamb, or other pet that old McDonald’s would be proud to call their own. 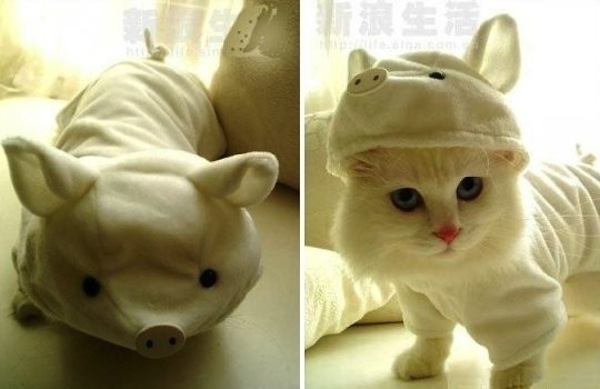 This “Piggy Cat” comes equipped with their own adorable snout and a cute little piggy tail. You can buy this cat costume online or with a few sewing skills you can set out to create your own unique take on this costume, perhaps in pink.